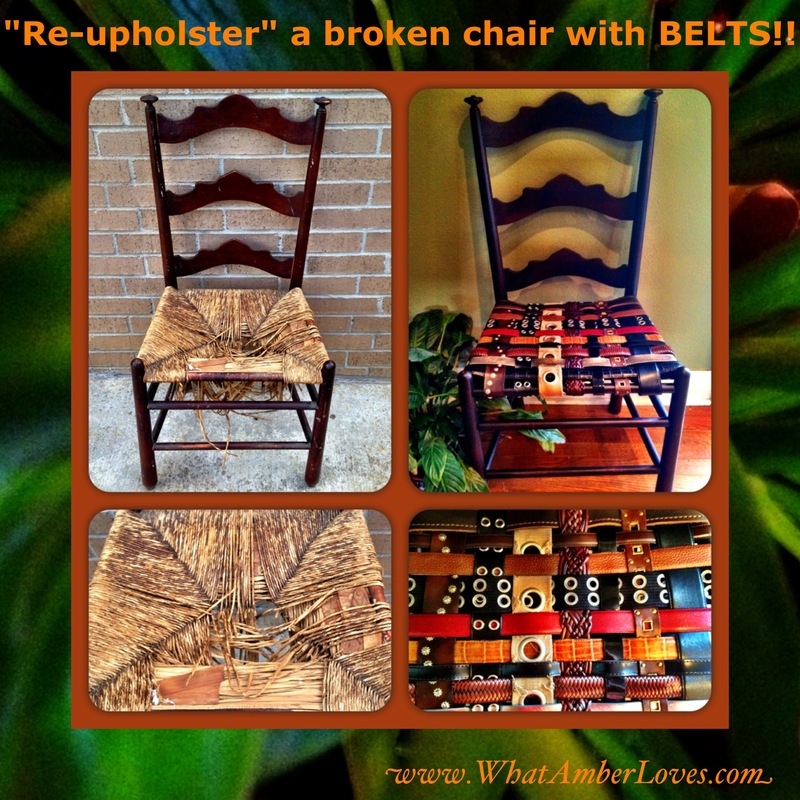 RePurpose and ReUpholster Chairs by using BELTS! Those of you who have visited our house can attest to just how much i love the use of contrast in design and decor. Few things please my eye more than a great study in contrast. Placing a pair of chrome, mid-century mod chairs on each side of an ornate, antique cabinet excites me. Having an unusual, re-purposed piece adjacent to something contemporary and common is what makes a space interesting, I believe. The room that we use as our “television den” was lacking pieces with character, but due to the oversized sofa and chairs, there was little room to add much more furniture. However, there is plenty of room for a straight-backed, armless chair (or two) on either side of a chest. Straight-backed, armless chairs occupy only a very small space, are great as spare seating during a party or holiday gathering, and can be pulled up to the big dining room table to squeeze in one extra guest in a pinch! So, the question became, where do I find such chairs that are actually interesting to look at, not just another plain chair?! Well, the answer was easy. See, several years ago, when our oldest daughter was a toddler, my mother gave us a small, child-size chair that had been hers when she was a child. It had a seat that was woven in rush (similar to caning) that was starting to fray and had discolored. I wanted to keep the chair. I decided to tackle the re-seating project myself using alternative materials. I considered fabric, neckties, and more, but ultimately, I was afraid that they wouldn’t be durable enough, then I thought of belts! They were perfect! Made of thick, heavy duty leather, if woven together, they would provide plenty of support, durability, and would be easy to clean if there was a spill. So, that’s what I used. Belts. Finding another broken chair was easy. I go to estate sales (where the entire contents of house are sold due to death, divorce, cross-country moves, etc) on Saturday mornings a couple times of year. There are several in central Arkansas every weekend, but who has time to go that often?! I wish I did, but our daughters’ schedules keep us so busy that a few times a year is all I get. Yesterday, I went to two estate sales. It turns out that these old, rush woven chairs with broken seats are common. Many are quite old, “antique,” I dare say. Through the years, when people have purchased new dining sets, upholstered pieces, and so forth, the old rush-woven and caned chairs get moved to porches, decks, patios, and garages. They deteriorate pretty quickly when they are left exposed to the elements. The chairs then get discarded, set by the street for the garbage trucks, or a lucky few get a price tag of a few dollars at an estate sale or vintage re-sale shop until someone comes along with a craft idea for how to re-use them. So, I just bought another one at an estate sale this weekend. Now, it is important to note that not all belts will fit perfectly. 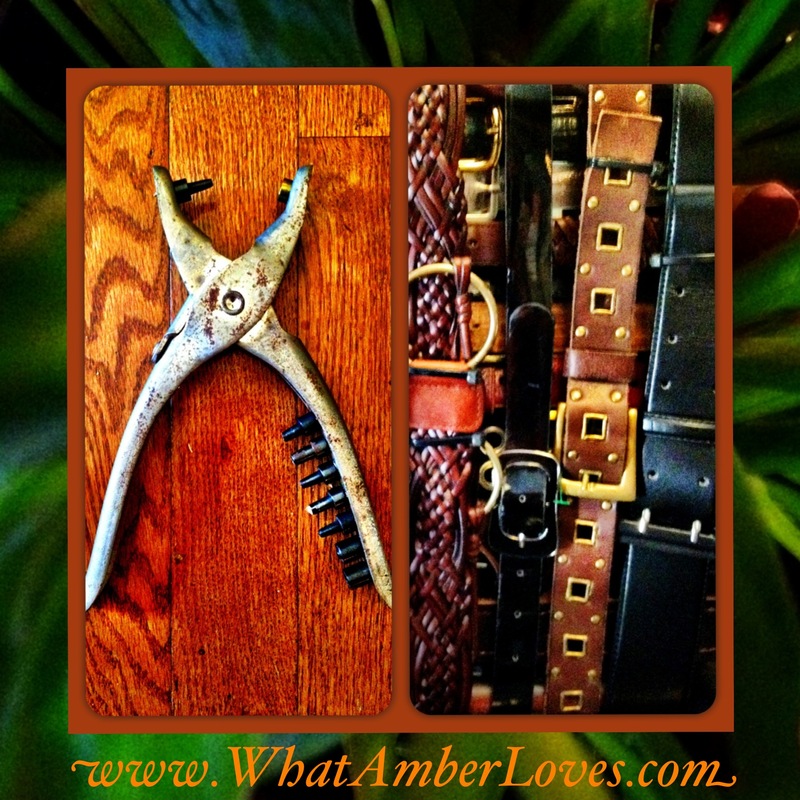 The easiest belts to work with were the ones that had holes, grommets, or weave that ran the full length of the belt. These belts are my favorite. In the future, if I ever do decide to re-weave the chair with traditional materials, these belts will be able to return to their original use as belts, unaltered! But, for the ones that didn’t fit, it was really easy to just use a hole-punching tool to add a hole where you need it. If you don’t have a punch tool like the one I’ve pictured, I’m pretty sure that you could just hammer a nail through the belt atop a piece of wood in order to make your hole. Enjoy my project or links? Please, pin it, tweet it, like it, whatever… just be social and feel free to share as long it links back to here, my watermark remains visible on my photos, and you contact me to let me know! 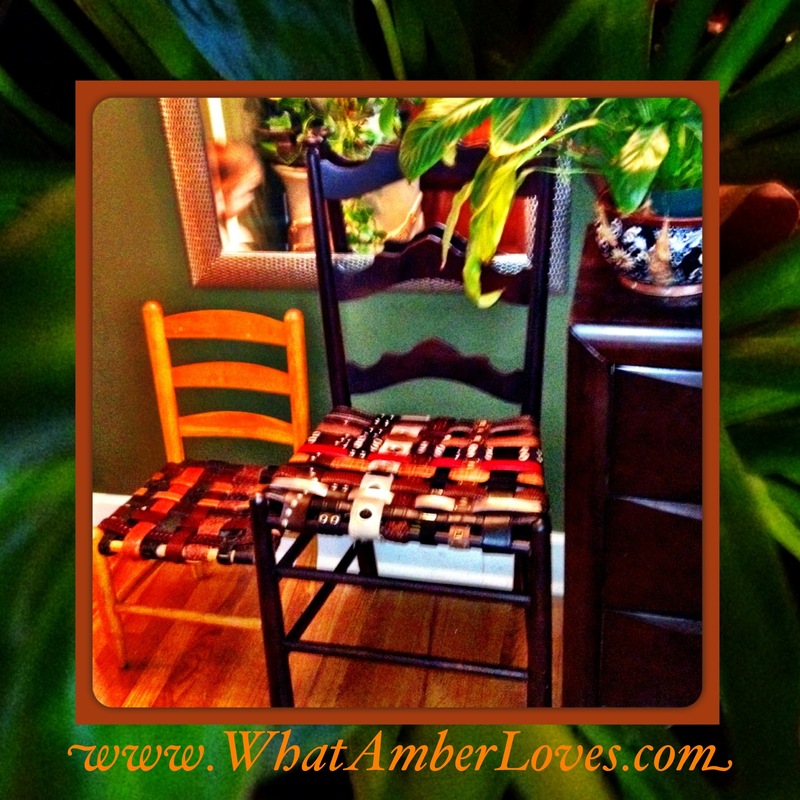 (WhatAmberLoves@att.net) I’d love to see what everyone else in the blogoshpere is making! Hi, again! Please, see my new “Press” page for info leading to other blogs/sites! Guess what?! I was featured!!! Posted on July 15, 2012, in Uncategorized and tagged armless chair, armless chairs. Bookmark the permalink. 27 Comments. I love a great repurpose! Your chairs look fabulous. Thank You, Gail! Now that I’m figuring our how to link, I’ll make sure to link to your party next week! 😀 It looks like a great group! What a creative and unique idea! Love it! I’m not sure why your thumbnail image didn’t post but I deleted it and entered it myself and it’s working. You’ll get the hang of it! If you’d like, you can copy the code from the party and paste it at the bottom of your post to show you’re linking up. You’re #150! Thanks for sharing! Thanks for your help, Roeshel! Great party! No belt is safe from me now. Really a bright and exciting idea. I love it–such great variety of colors. Thanks for linking up! I love how they turned out. Great job. Thanks for sharing at the All Star Block Party! That is really really cool! I also love the photos in a post above this where you did the water thing! Love! Now when I see a falling apart chair, I will snag that puppy right up! This is just fab and thanks for sharing at Get Schooled Saturday! What a great idea. Thanks so much for sharing with us at Hot Fun in the Summertime. Very clever! Your chairs look fantastic, I found you at Look What I made. Just wanted to stop by and let you know that I’m featuring this as one of my picks for the All Star Block Party features. This is great Amber! I am featuring you tomorrow! Hope to see you at tomorrows linky! What a fun and creative solution! Great eye for belt placement on such a cool project. 🙂 BRAVO!